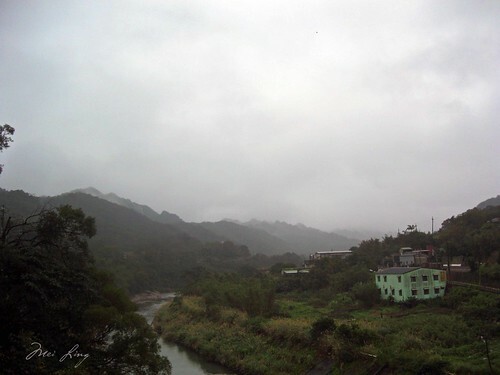 It was another rainy day in Taiwan but I was hopeful that it would clear enough so that we could launch a lantern into the sky with our wishes on it. 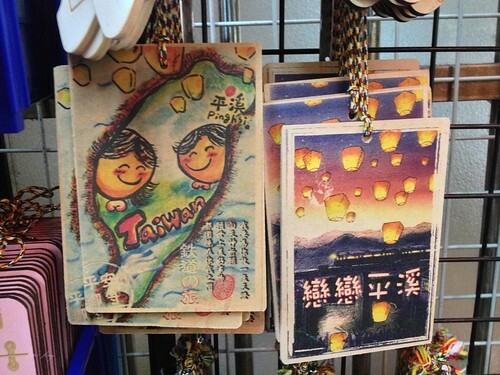 Pingxi and Shifen are known for their sky lanterns. People write their wishes on them and release them into the sky. I would love to come back one day during the sky lantern festival. 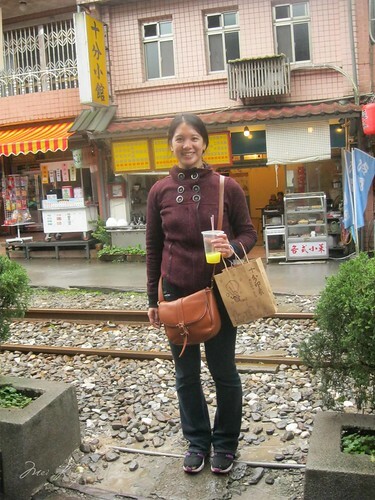 We had a quick breakfast and then went to Taipei Main Station where I bought all of the train tickets we needed. I booked us reserved seats on the high speed train to Ruifang Station (and for seats back because I had read that they sell out and if you don’t book in advance you might have to stand the whole way back). 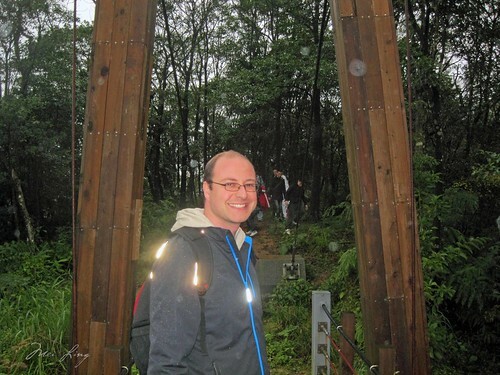 I also bought us all-day passes to ride the historic Pingxi line. 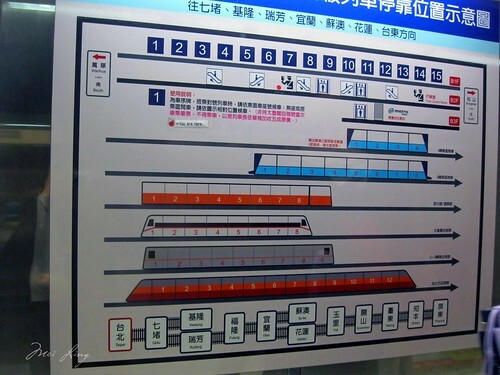 A map explaining the platforms for the trains in Taipei Station. 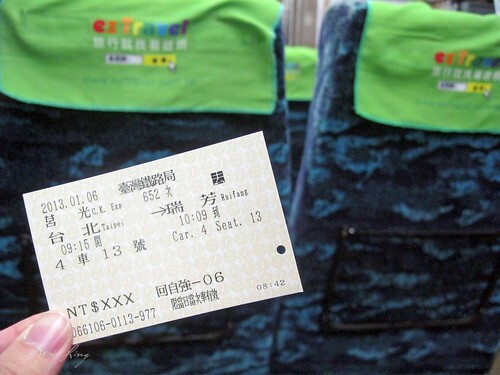 My ticket to Ruifang Station. Reserved seats are the way to go. 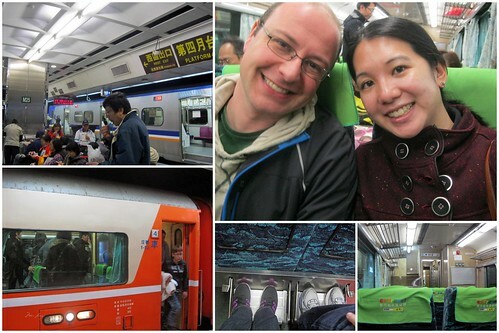 Dan and I on the train to Ruifang Station. 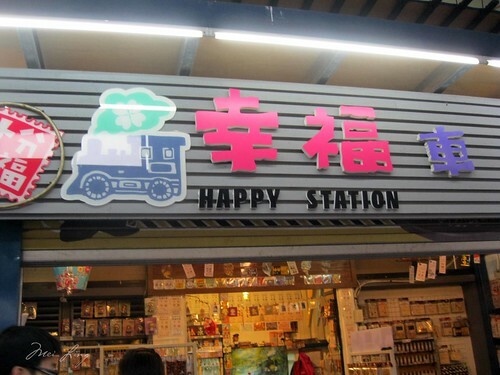 When we reached Ruifang Station there was some confusion. 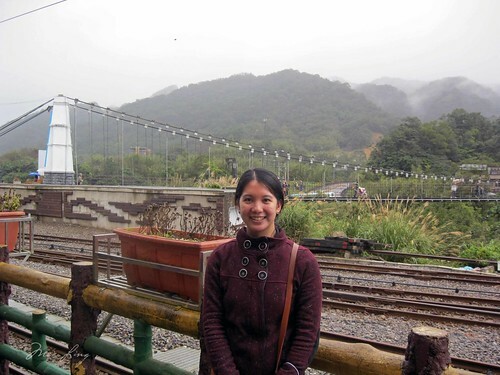 I’d read online that you needed to cross to another platform to catch the train on the Pingxi line. There was construction so after accidentally exiting the platform we went back on the platform and I asked the ticket checker where we should wait. He told us to wait on the same platform. The next train wasn’t due for another hour so we found seats and hung out. We watched other tourists waiting on the platform including a group of girls who set up their tripod and took a bunch of pictures. It was a little chilly but the time passed quickly (or at least in retrospect it passed quickly!). 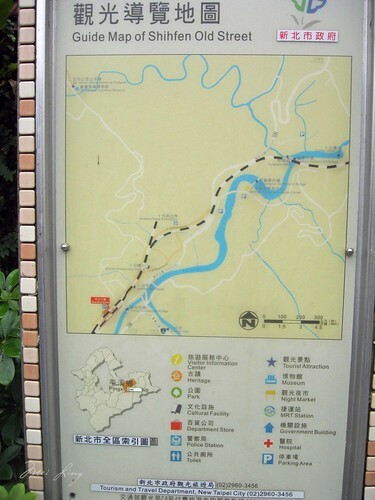 Map of the Pingxi line at Ruifang Station. My all-day pass for the Pingxi line. 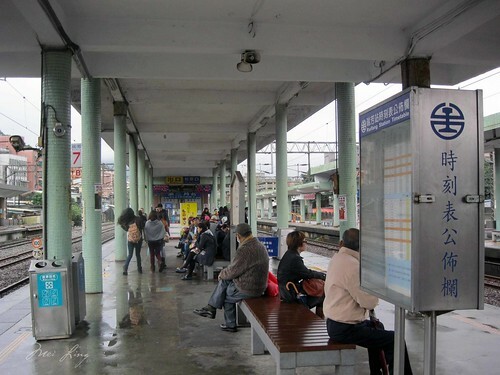 Waiting on the platform of Ruifang Station. 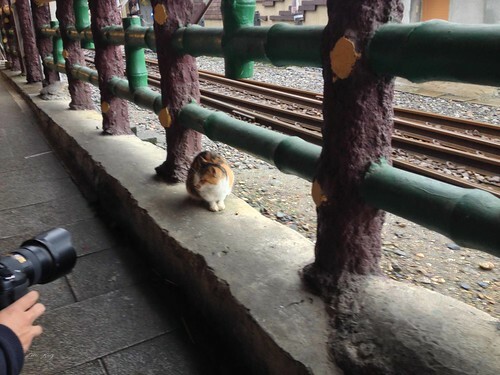 My plan was to ride the train all the way to Pingxi and start there. I’d read that some people go the opposite way and get off at the first stop and make their way to the end. 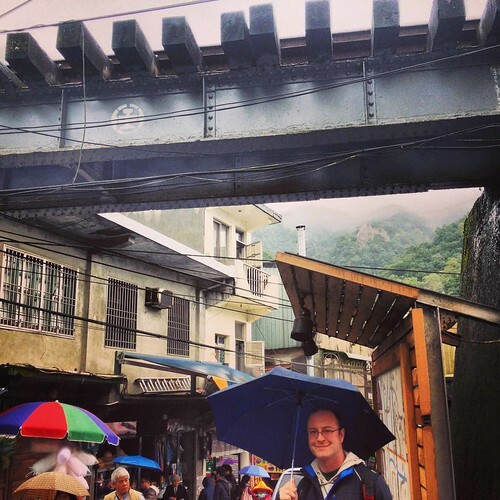 At this point it was pouring rain so we decided to just try to get to Pingxi and Shifen. It wasn’t really the right weather to visit any of the waterfalls my dad had told me about! 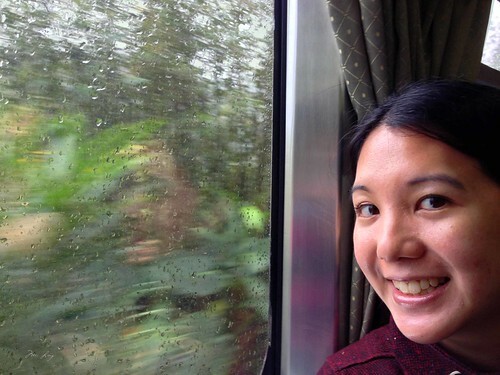 Me riding the train on the Pingxi line. Lucky Bamboo at Pingxi Station. 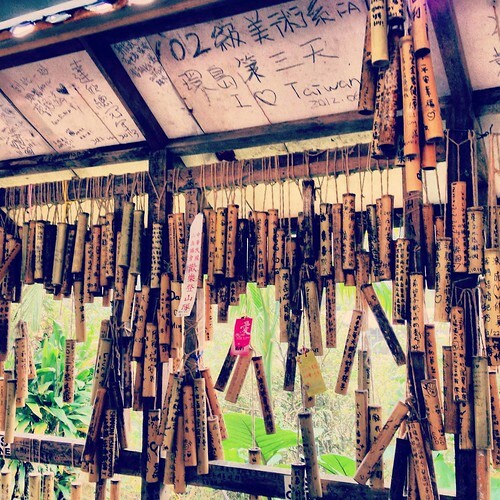 Apparently you could pay to write your wishes on the bamboo. This felt somewhat like a tourist trap to me so we didn’t do it. Because of the rain and because it was somewhat early the streets were empty. 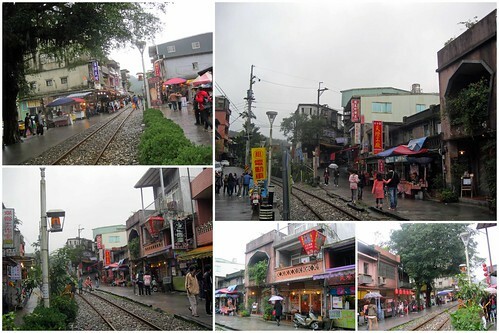 Pingxi charmed me with its culture and history, even in the rain. 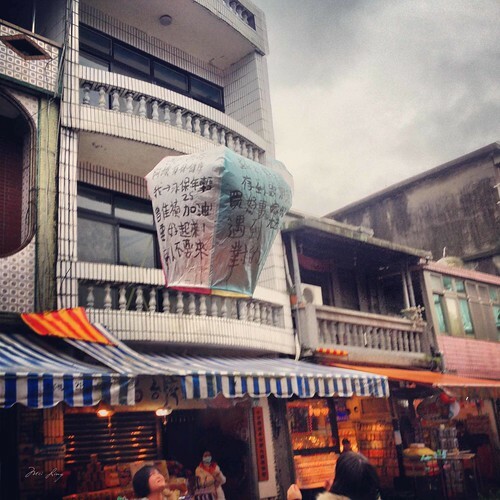 The rain was still heavy when we arrived so we decided to take a walk on Pingxi Old Street and see if it would clear up enough to launch a sky lantern. We were hungry at this point and had sausages with wasabi and garlic. They were delicious! While we walked around eating the sausages we saw some of the caves that were used as a bomb shelter during the war. I didn’t get any pictures since my hands were full with food and my umbrella. 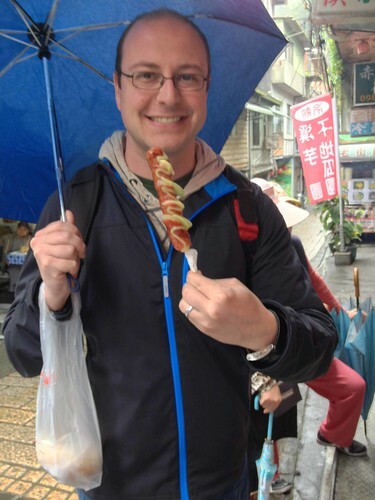 Dan and his wasabi and garlic sausage. It was delicious! 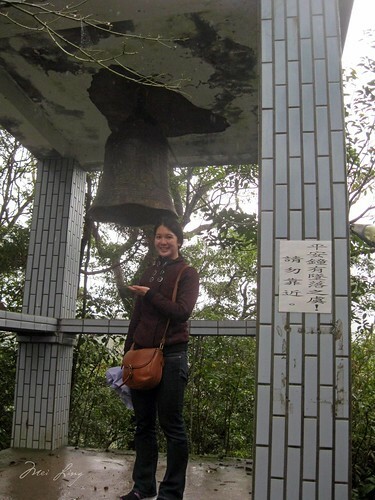 After quickly examining the caves we went up some stairs and found the old Bell Tower. The Bell Tower was built during World War II by the Japanese and used to warn people of air raids by the Americans. 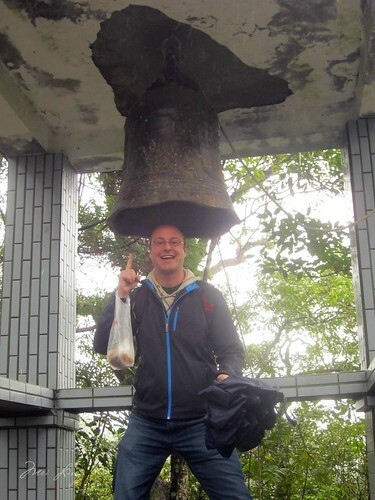 Me with the old bell. Dan with the old bell. 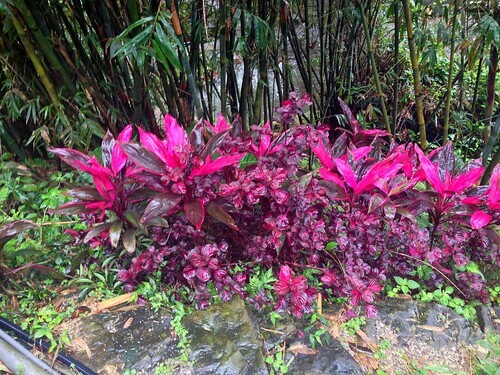 Some flora. 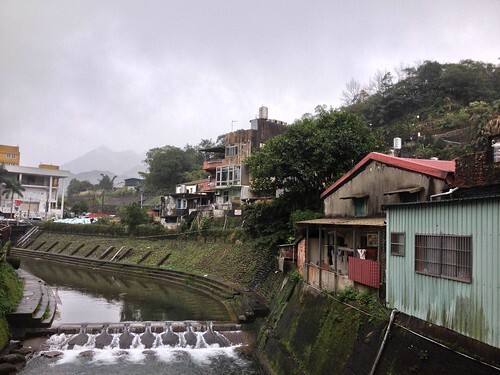 I found out that my dad took the same picture when he was in Pingxi a few months before us! 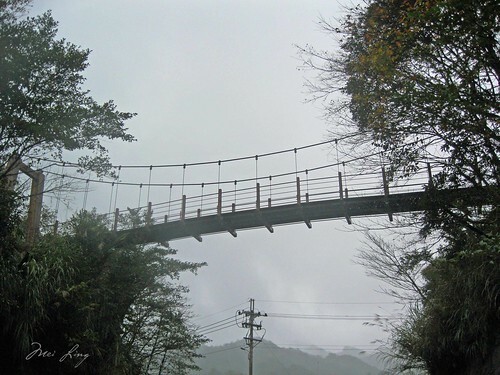 The Pingxi Bridge from below. Heading back to Pingxi Old Street. 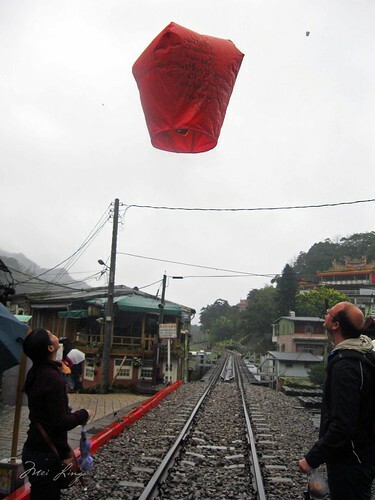 As we walked back into town I saw a sky lantern and told Dan that we should go do one now that the rain was lighter. 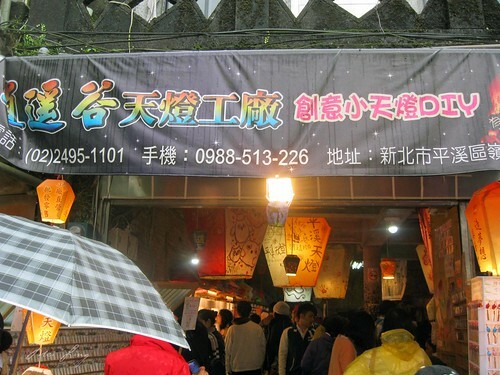 We went back to the sky lantern shop that we had passed earlier. There was nobody there so we went in and they set up a lantern for us for 100 NT. You could choose different colours so we chose red, mainly because it would look nice against the grey sky. Apparently a red lantern is for good fortune in the future. As we were writing people started pouring into the shop and before we knew it there was a line up! 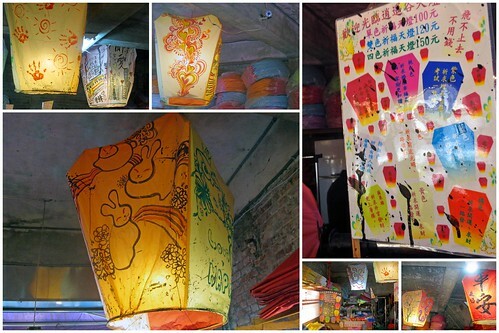 The sky lantern shop and explanation of the different colours. 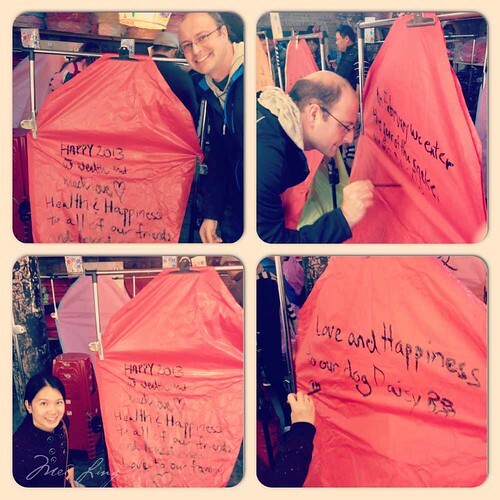 Writing our wishes on our sky lantern. When we were ready to go they took our lantern outside and set it up for us. They took pictures of us posing with each side of our lantern until they told us to let go. I loved watching it fly off with our wishes. Us posing with each side of our sky lantern. The man in the shop was a pro at taking these pictures! 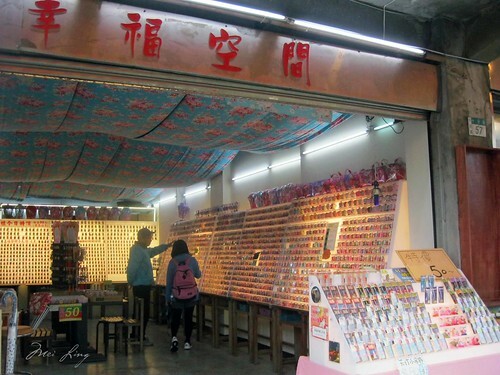 The line up in the sky lantern shop after we were done. We beat the rush! Afterwards we found the Antique Mailbox and took a picture with it. 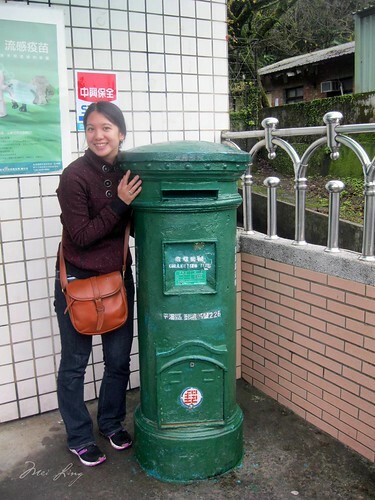 The Antique Mailbox has been in use since World War II and is apparently the only surviving Japanese era mailbox in Taiwan. If I had planned ahead I would have brought something to mail in the mailbox. Maybe next time. 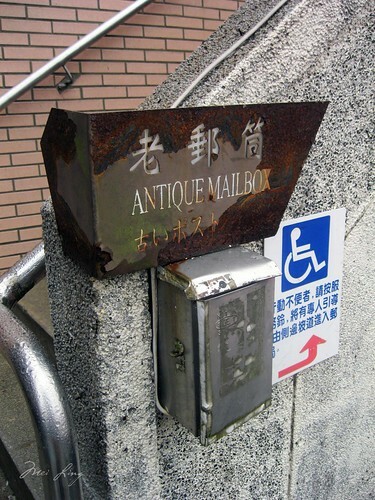 The sign for the Antique Mailbox. Some souvenirs that you can buy. 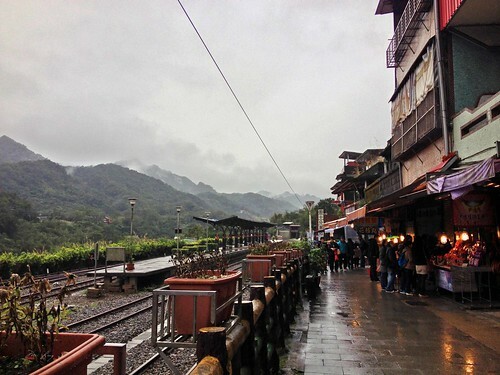 It started to rain again so we decided to take the train and head to Shifen. 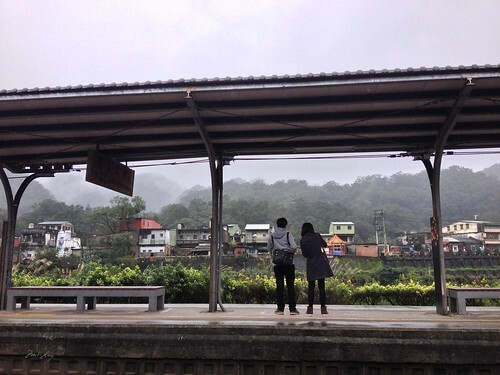 A couple waiting on the platform at Shifen Station. 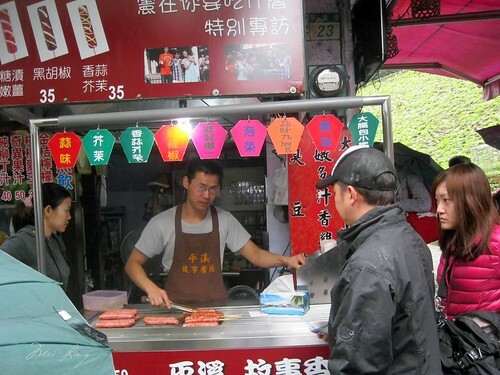 A cheesey gift shop in Shifen. I recommend skipping it. 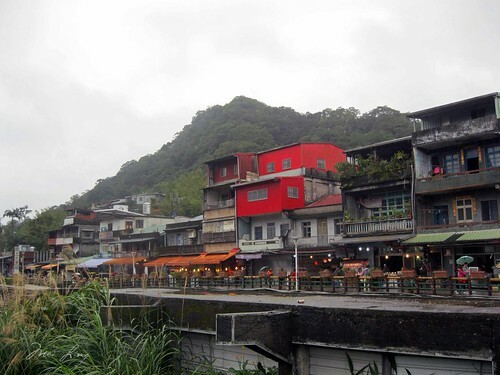 What I loved about Shifen was how the train ran right through the town. You have to cross the tracks to get from one side of the street to the other. 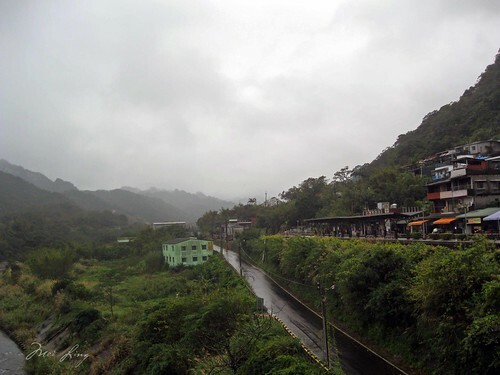 It just looked so beautiful and quaint with the mountains and the train tracks so close to the shops. It seems like something you don’t see as much these days. When we got to Shifen we walked past a shop selling mini lanterns. The lady in the shop showed us how the lanterns glow in the dark so I bought a bunch as souvenirs and gifts. 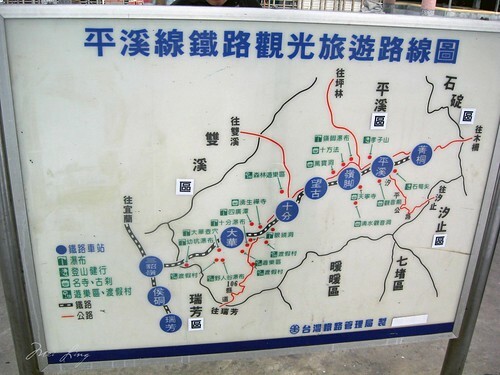 Guide map of Shifen Old Street. The shop where we bought our souvenir glow in the dark lanterns. 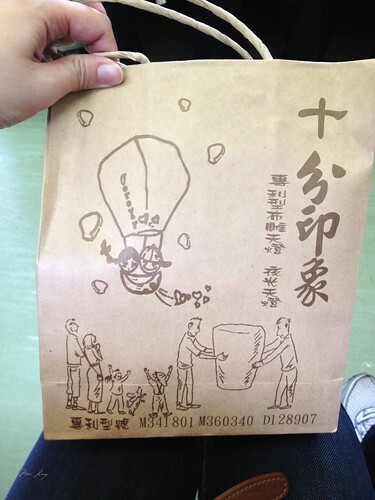 The bag from the souvenir lantern shop. It later got destroyed by the rain. Dan with the suspension bridge. 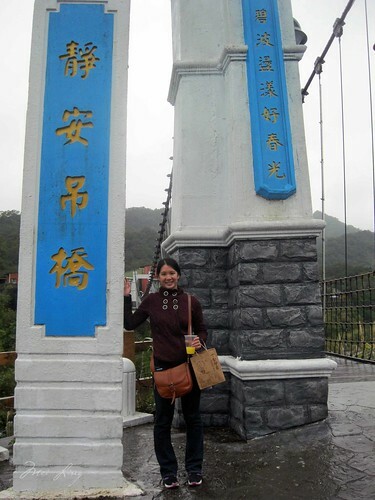 Me with the suspension bridge. 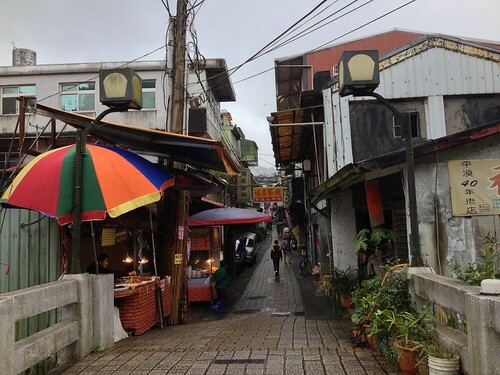 Looking back at Shifen Station from Shifen Old Street. 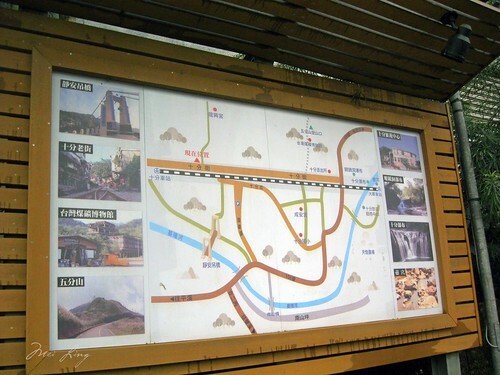 Map of all of the popular tourist sites in Shifen. 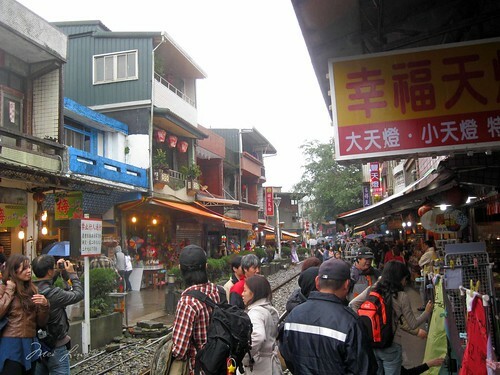 The train literally runs through the middle of Shifen. Afterwards we took a walk down the street and browsed the shops. There were lots of shops selling sky lanterns and a woman called out to me that they were only 100 NT. 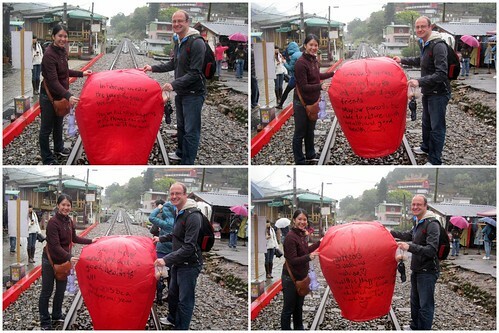 The price was consistent everywhere so I was happy that we didn’t overpay for our sky lantern in Pingxi. 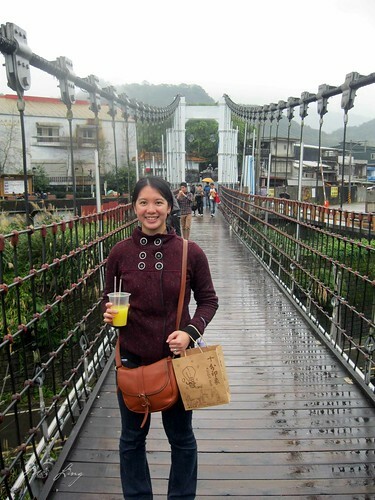 We bought some freshly squeezed orange juice and then crossed the suspension bridge for a nice view of Shifen and its surrounding greenery. There’s also a view of Eyeglass Waterfall from the bridge. Since it was raining we didn’t spend a lot of time looking at it. 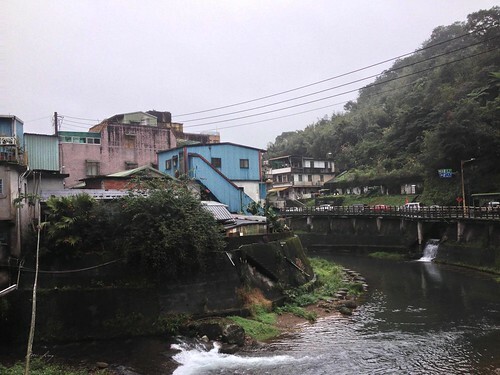 One of the big attractions in Shifen is Shifen Waterfall, which is about a 30 minute walk from Shifen Station. Because it was raining so much we decided to skip it. 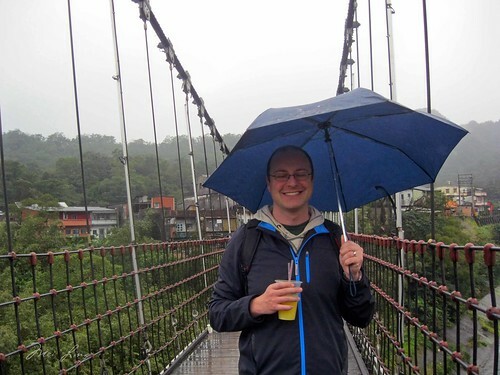 We crossed back over the suspension bridge, explored Shifen Old Street and then headed back to the station. 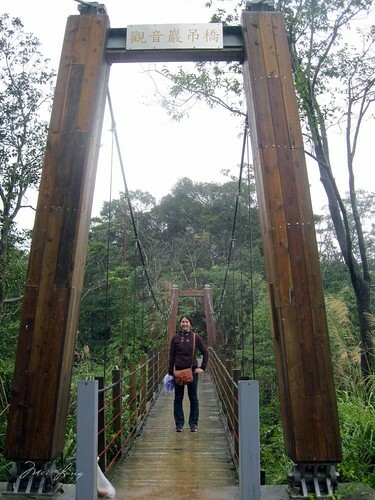 Me by the suspension bridge. 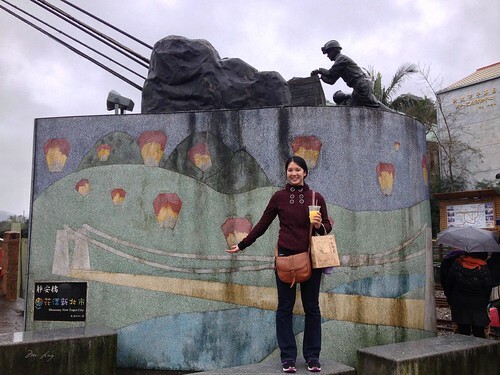 There was a mural of lanterns and the bridge as well as what looked like a coal miner on top. Me by the front of the suspension bridge. Dan on the bridge with his freshly squeezed orange juice. Me on the bridge with the orange juice. 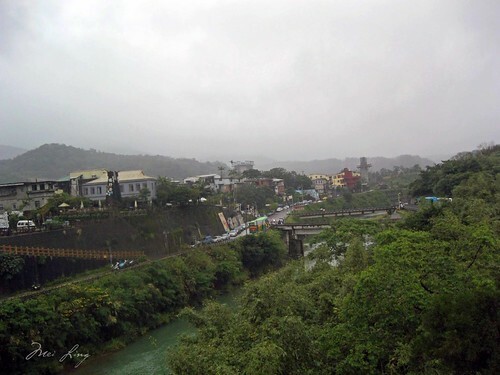 View from the bridge. You can get a good view of Eyeglass Waterfall from the bridge. I got part of it (it’s hidden behind the trees). 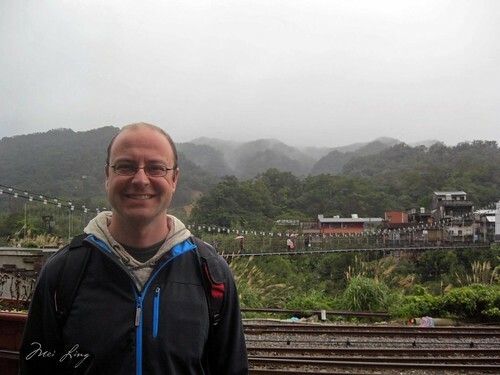 Me by the railway track in Shifen. This cat was like a model. Everyone was taking pictures of it. 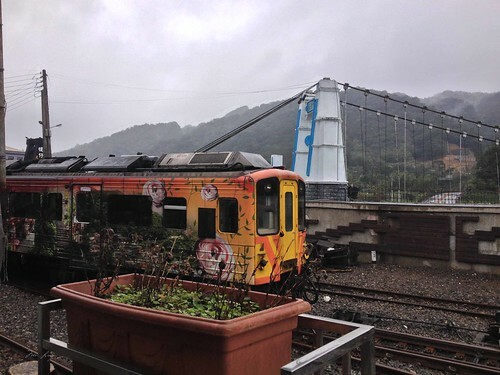 The train pulling into Shifen Station. 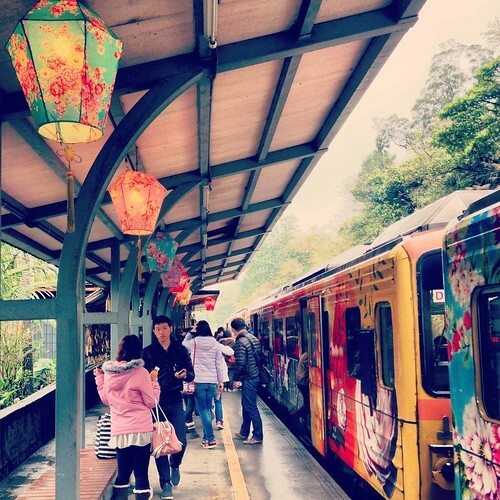 After the sky lanterns we decided to take the Pingxi train back to Ruifang and head to the former gold mining town of Jiufen. Hello Mei. 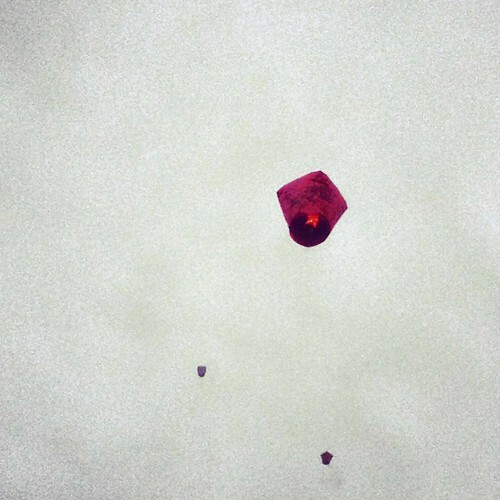 I found your blog through a google search for sky lanterns. Your blog was amazing! 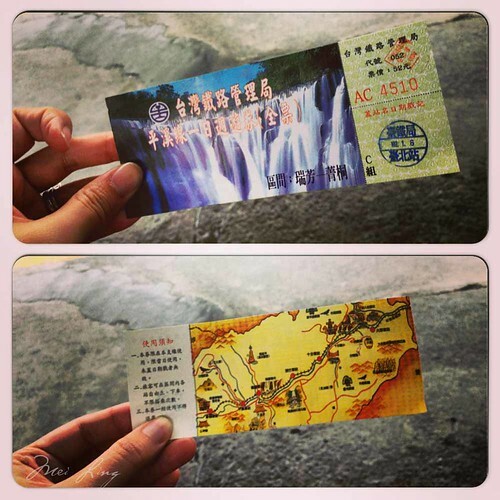 My wife and I basically used it as our travel guide for the day trip out to Pingxi. We loved everything about it and having it saved us so much time and trouble trying to figure it all out on our own. There was only one thing, and I’m only sharing this because others might be using your blog as well. 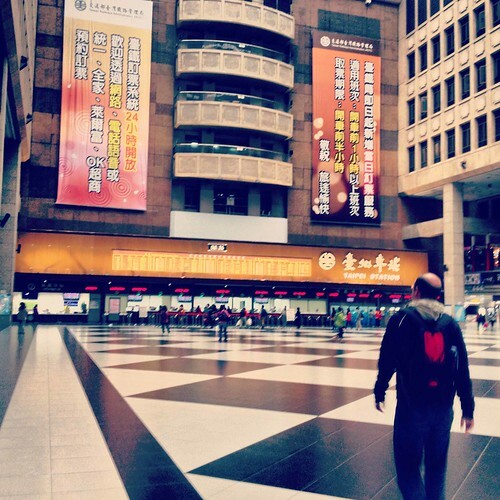 It wasn’t the high speed rail that went to Ruifang station. I think it was a local train and an express train difference and would help other readers if you changed that. Anyway, I hope I don’t come off as presumptuous. We loved loved loved your blog and would give you a pineapple cake if we could!